Thank you Mr Vial for giving us your time to answer some of our questions. Could you please introduce the Domain Les Roques de Cana ? classify the region of Cahors ino 3 appellations: Villages, 1er Cru and Grand Cru. The domain of the Roques de Cana would be 95% Grand Cru. The domain benefits from a fantastic terroir, with great sunlight in the Vallée de Cause. Who are the people working at the domain ? We have 2 full-time agricultural workers, 1 vineyard manager, 1 winemaker and myself who takes care of all the commercial and administrative part of the estate. In additional, we work with Mr Eric Filipiak as a winemaker and an adviser. Could you please introduce your different cuvees ? The domain Les Roques de Cana produces 3 different cuvee. The production depends on the year. It is a supple wine, a gourmet wine with a great acidty that leads to a perfect balance. It reveals notes of red fruits thanks to the stainless steel tank. 50% of the wine is vinified in a wine barrel. This is an exceptional wine,it is a deep black colour with purple hues. Fine and very intense smell with notes of red fruits (currant, gooseberry) with vanilla-mocha notes. The nose is frank and generous. The palate fleshy, very complex offering a very broad aromatic palette and a lot of length. This is a rare wine that we will remember. How do you explain the name of the cuvée ? Mr Guiette is a very religious gentleman and the domain is very closely linked with French history. The wines have been drunk by the kings of France, included Francois I, and as you know, wine has always had a prominent place in the Christian church. The wine market in the UK is very international. For many English people, the French Malbec is less famous than the Malbec from Argentina. So what is the difference ? There is a vast selection of wines available now from New World and the Old World wines . Without generalising, the Argentinean Malbec does not seek the complexity but rather easy to drink for the neophytes. In my opinion , it is a modern wine in its construction, which has softer tannins, with a woody structure. Whilst the French Malbec which is at the origin, has firmer tannins, bitter and tasty. Is Malbec still perceived as a wine of lower reputation than its neighbour Bordeaux? Does the region have a history? Are you swayed by the Argentinean Malbec fashion? As we note more and more vine growers indicate the grape variety associated with Cahors on the bottle. Cahors wants to get its own reputation and does not wish to be compared to wines from Bordeaux. They have their own vineyards, their own qualities and their wine have a real identity. There is significant work that has been done by Argentina in the early 2000s to develop the reputation of the Malbec grape variety. Malbec is internationally recognised which allows the appellation Cahors to enjoy greater recognition through the use of the grape variety. The notoriety of the name Cahors is spreading quickly due to a 100% increase in exports over the past 10 years. Cahors is showcasing itself as the capital of Malbec worldwide. Where are the main markets ? Our Export market share is about 80% of our sales with a large market in China and the Scandinavian countries such as Norway, Sweden, Denmark and the Netherlands. With regards to marketing, how relevant are the medals to you? We do not want to present our wines at wine competitions. We are content with only the 5 best wine critics in the world. We presented our first vintage at Salon Vinexpo where it was voted the best Malbec in the world in 2008. Then this title was confirmed in 2009 and 2010. After that, we stopped presenting it. But we are thinking of doing it again this year. How do you communicate about the domain? First of all, we wanted to mark our difference with a different and iconic bottle. We are very active on social networks and we often go to wine fairs such as Prowein in Germany, Vinexpo in Bordeaux..
How do you feel about the 2018 vintage? Fantastic! In terms of quality and quantity 2018 will be a great year. The alcoholic fermentation was very fast. Our harvest was from mid-September and we finished on the 3rd of October. In total, the actual days spent physically harvesting the grapes were less than 10. 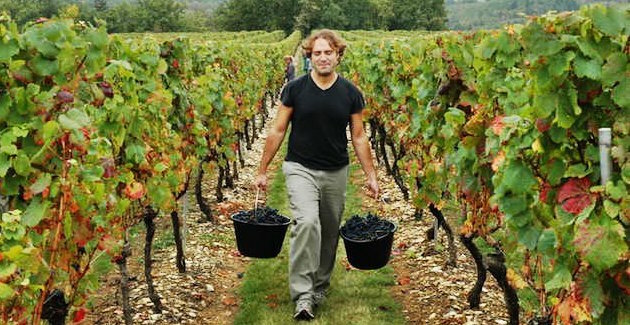 We collect the grapes by hand after taking samples for the next day. The we send the grapes to the laboratory to see if they have matured. How do you know if the grape is ready to be picked up ? The three main acids : tartaric, malic and citric acid. Why are you not organic ? In case of rain, hail, bad weather, we can treat without risk of losing our harvest and thus the survival of the estate. What is the ambition of the domain ? To keep the same great quality and to stay one of the best Malbec in the world. Many Thanks, Mr Vial, Assistant Director of Les Roques de Cana. Sommelier tip’s : What Temperature should you serve your wine ?